Nye demonstrates how to protect yourself against global warming heat rays. Apologies for the re-send. Certain events intervened and I posted the original too early. The Stream article is now live. March For Science Descending Into Farce: Intersectionality and Diversity edition. 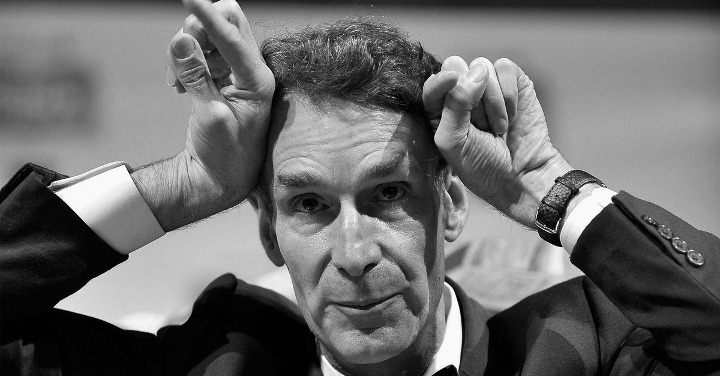 Last thing the March for Science needs, say some agitated folks, is Bill Nye, the error–prone “Science Guy” co-leading the parade. Why? See, Nye is white. And a man. And some organizers are concerned that onlookers will notice Nye is white, and a man, and project his male-whiteness onto Science itself. That in turn will cause the gullible to figure Science is mostly done by white men. Which, historically and in many current fields, it was and is. Now this fact is for good or for bad, but it is a fact. And it’s not likely those who say they are “for” Science and “Reason” would be pleased were the contributions from white men removed from Science. So long, Calculus! Proof? Buzzfeed reports that, so far, the March for Science has already gone through “four diversity statements“. And for instance the Twitter account @ScienceMarchDC tweeted (and later deleted) “colonization, racism, immigration, native rights, sexism, abelism, queer-, trans-, intersex-phobia, & econ justice are scientific issues.” The tweet also pictured a black power fist and rainbow flag icons. Actually, of course, Science is silent on all these matters. But that’s because Science is mute on every moral and ethical question put to it. Including the question whether to deign to include a white man holding a Science baton. The March organizers want us to know what they stand for (emphasis original). Sound like politics to you, and not Science? That was the effect they were going for. Organizers insist “It was a mistake to ever imply that the March for Science is apolitical — while this march is explicitly non-partisan, it is political” (the original statement was in bold type). and monitored balance between people from favored political groups, is not a scientific concept. It is pure politics. And anti-scientific politics, at that. There is zero evidence, for example, that men and woman are equally competent research mathematicians. Marchers call this a “disparity”. The rest of us call it a banal consequence of Nature. Yet Marchers insist on the theory of Equality, which says that men and women are innately equal in all abilities. When theory is more important than observation, we are in the realm of politics. And we observe, for instance, throughout all of history and in all circumstances an enormous preponderance of men occupying the top seats of mathematics. The theory of Equality (when applied to mathematical ability) is therefore almost certainly false. The observation has thus quashed the theory. When observation is allowed to rule over theory, we are in the realm of Science. March on over to see the rest. It’s a shame you are unable to understand this – preferences. You look back at history – which is absurd on the face of it. You look at numbers without considering why they are what they are, just that they are. Anything but preferences, because that’s where it gets complicated. It’s why conservatives get so angry about “liberal academia,” or the “liberal media.” For a host of reasons, some we understand more than others, women and men, liberals and conservatives, rural people and urban people, people from one culture and people from another, have different preferences for what they want to do with their lives. A conservative is less likely to want to be a college teacher than an evangelical preacher. A rural person is more likely to want to be a veterinarian than a subway cop. Again, there are exceptions, as always, there are all sorts of causes, yes, biology seems to play a small role, but so does a host of other factors. But this piece of yours here is just more insecure-conservative-man clap-trap. JMJ–this has nothing do with “girls can’t do science” when of course they can. This has to do with the absurdity of targeting Nye as a White Guy. Thanks for the neo-Marxist, SJW rant to add additional credibility to the points made by Briggs. Well done, comrade. JMJ, are you aware that men are 11 times as likely to die from job-related incidents than women? How to you propose to factor this into your equal pay for equal worth agenda? I would have preferred to be an NBA all-star or a Hollywood leading man. Unfortunately I was discriminated against by “skillist” and “lookist” discriminators, and had to settle for a statistics degree….. There are twice as many males as females as one approaches the level of gifted IQ (130). LOL! Just so you know, it is highly unlikely that any of you who replied to my comment have an IQ higher than mine. Did you just third-grade taunt us with your high intelligence? You might be surprised, given the rather specialized stuff our host provides. Anyway IQ “measurements” become, ah, rather difficult, after a mere 150 or so. It’s not a metric but an ordinal heterogeneous order. Just so you know, it is highly unlikely that any of you who replied to my comment have an IQ higher than mine. The March for Science organization has, on its website, a goal about discussing issues of bias in STEM-related fields…increasing awareness and thereby remedying some bias/discrimination. Harvard Business Review (HBR) notes (see https://hbr.org/2015/03/the-5-biases-pushing-women-out-of-stem ) that repeated basic studies show such bias exists — identical papers presented by a male vs female author, for example, get evaluated differently, consistently differently, with the female author consistently leading to a diminished perception of the research quality. The HBR article notes that this diminution of female contributions is observed by both white males AND other women/other minorities. So, the March organizers would, if they could get their way, be addressing the same bias in all groups–including the minorities. If a woman’s prowess at research & contributing to STEM fields is better than a male competing for a STEM position, wouldn’t it be better for all of us if she got the job? Wouldn’t it be worse for all of us if stereotypical bias, based solely on gender, led to the inferior [male] applicant getting the job? I’ll buy that wholly (we know that male brains tend to outperform female brains in such areas AS A GENERAL RULE). But I cannot accept Briggs’ remark without conceding that some women are truly exceptional (way out in the exemplary side of a curve’s tail) and truly outperform men in a general field in which men may generally dominate. The proof too the contrary is overwhelming (Marie Curie, and many many more since ought to come to mind). Briggs remark (among others here) serves to preserve the application of stereotypes by shutting down consideration of applicable nuances that matter to us all (if such ‘thought stopping’ is not the overt motive, the effect is the same, regardless). The “Marcher’s” are not asking for equality of representation in STEM fields, they’re asking for equality of opportunity to compete and gain access…big difference that. I say, give it to’m! If they can perform in a competitive STEM area, more power to’m…and if unfounded stereotypical biases are getting in the way, biases that favor an inferior contender [simply because he’s male] then those biases need to go. Briggs argues that the Marchers are engaging in politics — and he’s right about that…though they want to remove gender-based bias known to discriminate against women (in particular). That kind of bias IS politics…but not the type of politics we ought to be preserving via argumentative “sleight of hand” arguments that shut down objective considered evaluation. Sometimes, when politics is the problem, politics is also part of the solution. You know you have a high Intersectional Quotient when you get an extra point for being differently Intersectionally Quotiented. Joking aside, it seems to me that your first post re Briggs’s article is connected with it only tangentially. Had you written it without first having read Briggs’s article then no-one, I suspect, would have been any the wiser. That is not to say that I think Briggs’s article is beyond criticism, but I understand the difficulty he will have had in finding the right balance when dealing with March for Science’s confused and hypocritical output. How does one make the blindingly obvious even more obvious? Ken, you are certainly Mr. political correctness extraordinaire. Hint; Mrs. Currie got her price, for….well being there. All real science was done by her husband and his friend the actual originator of the idea. Mrs. Currie had only one thing going for her, the ability of woman to do utterly mundane tasks for hours at the time. Just like a knitting. She was put in charge of sifting/washing through tons of dirt to get some desired materials the Gentlemen used to do their science. Yes, they were gentlemen, they included her name in the final report….and so we have the famous female scientist. And by the way, whatever would come these days (for a few decades now) out of Harvard is just a politically correct feminized junk. Ever since we rejected the founding philosophy of our civilization (Catholicism), we are on descend to hell, on any level. It is incredibly obvious in the field of science. The last 50, going sixty, years was the first period in the history of the Western Civilization we invented ……well, nothing. Nothing of WOW value. Stuff which puts humanity forward. You know, like invention of the airplane,… penicillin….etc. Only what we managed to do with all those female scientists is to invent I-phone 7…..wait a minute, that is still just another phone. And it still does not make a good cappuccino .